Anybody who cares about New York’s history and architecture as like as not has a well-thumbed copy of Nathan Silver’s Lost New York sitting on a bookshelf. My own copy is a 1974 Schocken reprint – and it was one of the first books about New York that I found on returning to the city from graduate school in 1976. Flipping through its pages still makes me shake my head in wonder at how many marvels we’ve lost. But in 1976, there was already a Landmarks law and a Landmarks Preservation Commission. Back in 1963, when Silver first conceived the book, neither existed. The show opened in 1964; the Landmarks Law was created in 1965; and the book finally appeared in 1967. 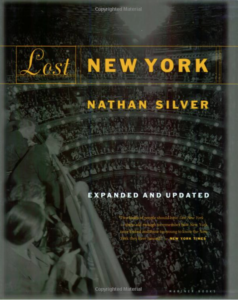 Almost on the day of publication, Nathan Silver’s “Lost New York” was proving its point. Word got out of a plan to put an office building over the Grand Central Terminal waiting room, a possibility that must have sharpened the pain Mr. Silver still feels over the intrusion of the Pan Am Building… Two kinds of people should have “Lost New York” – those old enough to remember how New York once looked and those too young to know the New York they have missed. If you like big cities, especially as they used to be before the let’s make-everything-look-alike crowd took over, you’ll find both memories and plenty to be angry about in “Lost New York…. Mr. Silver’s beautiful and appalling volume embraces several books at once, and they are all sad. That last section may be the most interesting, in that it repeated the list from the 1963 show, left deliberately unchanged to show the gains and losses of the few years inbetween. Those landmarks in danger that were in fact lost for good included the Singer Tower, the Ziegfeld Theater, the Astor Hotel and the Metropolitan Opera. Those saved from destruction include the Haughwout Store and the little Singer Building in SoHo, the J.P. Morgan Residence, the Seventh Regiment Armory, Ellis Island, the Hall of Records, the Custom House, and Sailors’ Snug Harbor. The losses are great, but the victories of the new preservation movement are remarkable – to think that we almost lost the Seventh Regiment Armory, the Custom House, Sailors’ Snug Harbor, and so many more. In 1963, he recalls, ”I was the lowest ranked assistant professor, so they gave me the worst job — exhibitions.” The demolition of Penn Station was a burning issue, especially with the younger generation of architects — it was they, not the established architectural historians, who picketed the station. Mr. Silver said he thought that ”a series of photographs of all the buildings we’ve lost” might interest people. He dug away at stashes of old photographs at Columbia’s Avery Architectural Library and other places, stunned at the richness and variety of the buildings that had vanished…. 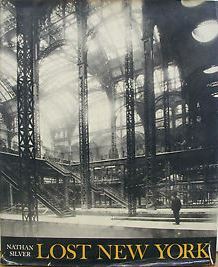 He says now that ”when the book finally came out I thought it’s too late, nostalgia is all over now.” But the book’s moving prose and evocative cover — an atmospheric shot of the interior of Penn Station — kept ”Lost New York” in print until 1998, selling, Mr. Silver estimates, about 100,000 copies. In just a few months, the city will be awash in exhibitions and events celebrating the 50th anniversary of New York’s Landmarks Law. How appropriate that Mr. Silver – who has spent the past half-century living and teaching in England – is making another return visit. He will be speaking on Wednesday morning, December 10th, at the Bard Breakfast – the annual gathering organized by the New York Preservation Archive Project. In today’s New York Times, David Dunlap updates us on Mr. Silver’s life, and on his thoughts about New York’s lost monuments – click here to read it. Tickets for Nathan Silver’s talk next week are still available – click here for more information. I have been searching for something that will tell me if you do tours of Grand Central Terminal. I recently booked two tours for friends for the Woolworth Bldg and was advised that your tours are the very best. Is anything available for Grand Central Terminal being scheduled for the any time in the future?